Zoe had been talking about wanting to go fishing for a very long time. But... Nick and I don't fish. And... Zoe is a girly girl. She doesn't like to be dirty. She doesn't like to touch stuff. Zoe also doesn't really like to sit still... or be quiet. But this summer... she went fishing. 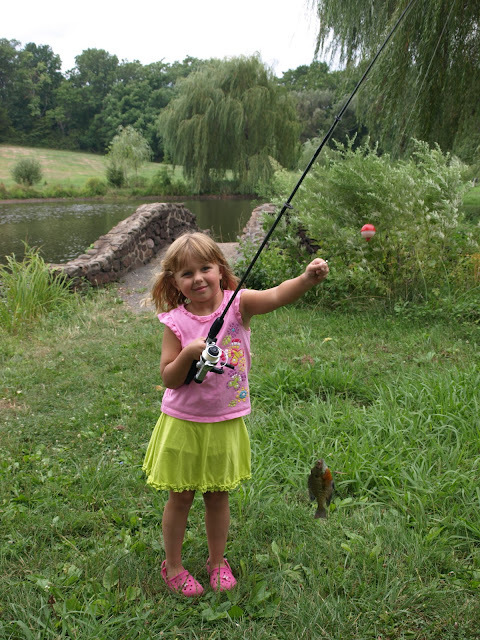 She went fishing at the beach in NC (2 times) and she went fishing at a pond here in NJ. And Zoe? Well... Zoe LOVES to fish. I didn't go with her... but I'm told she was quite a good fisherman. I wonder if this means I'm going to have to start fishing?